Hailing from Bristol, the riotous quartet Heavy Lungs landed in the sold-out Manchester’s Castle Hotel for their 7thdate of the new year. After relishing in a meteoric 2018, touring with punk’s beloved IDLES on a string of sold-out UK dates, Heavy Lungs are hell-bent on not only pushing the door open that they’ve so firmly got their foot in but kicking it down. Kicking off the evening were the tormented underdog’s Vulgarians who managed to make a tiny 70-person capacity venue feel so much larger. The sheer vigour that they had accumulated together made for a slightly unnerving yet thrilling and explosive set which had the audience perfectly primed for the remainder of the evening. The venue’s dark-panelled walls glistened with condensation while the ceiling dripped with pellets of water, providing the perfect backdrop for Heavy Lungs to take their positions on the cramped ‘stage’. At least a quarter of the audience were trimmed in IDLES merchandise as Talbot’s famed friend Danny Nedelko took centre stage with a wide-eyed stroke of madness. Opening with the band’s unreleased track ‘Half full’, Heavy Lungs immediately instilled a profound sense of confidence as drummer George perfectly matched Danny’s fervent demeanour. Frontman Danny’s presence was brought to life with his dramatic prancing which quirkily remained out of time with the main beat of the band’s setlist. With his arms splayed out at each side with a brisk strut, Danny mirrored the commanding presence of an orchestral conductor. However, presumably due to technical issues, the frontman’s vocals were often drowned out amongst his musical counterparts making for a fuzzy, comprehensible noise rather than a stimulating sermon. As the set progressed, this, unfortunately, didn’t improve and the only speech I could make out was George’s comedic interruption of screaming “Isn’t it cold outside?” repeatedly mid-way through their performance. Not that you’d have known with George stripped down to a pair of (Umbro?) sports shorts and Danny’s bare chest. Despite the growing frustration of not being able to hear the vocals, Nedelko and his dynamic quartet certainly kept their audience’s attention in their clutches as the band unrelentingly powered through their more famous tracks ‘Poster Boy’, and ‘Stutter’. Nedelko’s determination for a riot culminated with a launch into the crowd, staining his pristine white roll up trousers. 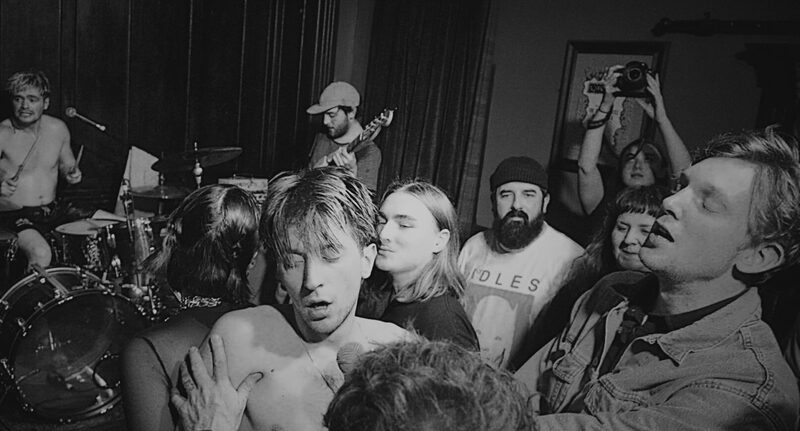 Heavy Lungs are perhaps on the verge of becoming a common name within the re-emerging ‘underground’ punk scene alongside Lice, YOWL, and Hotel Lux. I certainly hope so – despite the technical issue and slightly disappointing crowd reception, there is a very strong potential that can be found in this Bristol quartet, especially when you remember they only formed in 2017. Heavy Lungs are certainly ones to watch. Armed with plenty of potential and attitude, 2019 undoubtedly holds an exciting year for the Bristol boys.